Pictures galore from your suite atop an overlook. Minutes to all attractions. Property 2: Pictures galore from your suite atop an overlook. Minutes to all attractions. Property 5: Serene, Charming Rural Retreat Yet Close to Town. Property 7: Amazing Location Close To Downtown And Albuquerque Zoo unitB! Great Location, Up Town area, on the Bike Path, two minutes drive to the Malls. Property 10: Great Location, Up Town area, on the Bike Path, two minutes drive to the Malls. Cozy Corrales Studio w/ Mtn. Views Near Santa Fe! Property 13: Cozy Corrales Studio w/ Mtn. Views Near Santa Fe! Property 16: Stay With Us In Our Wonderful Casa in Rio Rancho! Close Balloon Fest Shuttle. La Casa in the Vines - 2BR 2BA - Walk to Old Town! Property 19: La Casa in the Vines - 2BR 2BA - Walk to Old Town! Luxury studio apartment fully furnished and stocked. 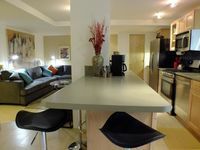 Property 23: Luxury studio apartment fully furnished and stocked. Property 24: Great Old Town Location!! Mid-Century Mod Cottage in Trendy Downtown Location! Property 40: Mid-Century Mod Cottage in Trendy Downtown Location! Gracious hosts, well kept, clean, quiet. Beautiful grounds. We thoroughly enjoyed our stay at this property. It is one of my favorite VRBO rentals so far. The location was beautiful with hiking right out the back door. Erica invited us onto her deck where we could enjoy a beautiful view of the city at night. The accommodations were comfortable and thoughtful. Thank you, Erica. You were a great host!